Aligarh, April 15: The first round of polling in eight constituencies of western Uttar Pradesh signal some impressive gains for the BSP – SP Alliance. For the BJP and the Congress, it is a wake up call. There is growing evidence that while BJP appears to have taken a strong cue from the first round of polling, the Congress party poll managers still appear to be clutching at straws. it is becoming increasingly clear that the Congress party victory tally in the entire state may not cross even the half dozen mark according to poll watchers here. On the other hand, judging by the Prime Minister’s speech here yesterday, the BJP strategy now appears to be focussed almost totally on communal polarisation by raising the pitch on issues based on hyper nationalism and jingoism. Addressing an election rally here yesterday at the Exhibition grounds, the Prime Minister’s opening gambit was, ” Don’t you think we have to respond to those people who refuse to say ‘Bharat Mata ki jai’. There are enough indications that the BJP could improve its performance in the second and third round of polling in western Uttar Pradesh. On the other hand the Congress appears to have failed yet again to read the writing on the wall. 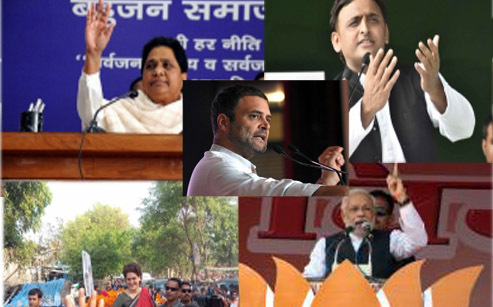 Reports emanating from several districts of western Uttar Pradesh clearly suggest that in at least half a dozen seats in this region triangular contests are taking place and in each case, the beneficiary appears to be the BJP. The Congress party is clearly in the third position in such contests and seems to have willingly donned the hat of a vote spoiler. There are credible reports from prestigious seats including Moradabad, Bareilly and Aonla, where division of votes between the Alliance and the Congress is likely to result in unexpected victories for the BJP. According to Mohammad B. Shamsi who runs a successful business in Moradabad, the Alliance candidate Dr. S.T. Hasan who is a medical practitioner in Moradabad appeared to be in a very comfortable position till about a week back. There is an old saying that ‘ in politics a week can be as long as a life time’. It remains to be seen whether the Congress leadership would continue to dither or whether it can still pull out an ace to salvage what appears to be a disastrous situation in U.P. Reports are also trickling in from neighbouring states like Rajasthan, Madhya Pradesh and Delhi, clearly suggesting that the BJP will perform better in all these three states than what was being predicted a few weeks back. This is not because of the fallout of the Pulwama incident as was earlier being talked about. ( Notwithstanding the fact that flouting all norms the BJP is not losing any opportunity in appropriating the credit of the armed forces for the surgical strike. ) It is primarily because the BJP campaign managers have succeeded in evolving realistic local alliances by which they hope to counter a very palpable anti incumbency sentiment all over the states. The congress on the other hand is paying the price for not forging a broad strategic alliance in the Hindi belt .